The Thamud and the ‘Ad People (branded) as false the Stunning Calamity! And the earth is moved, and its mountains, and they are crushed to powder at one stroke-On that Day shall the (Great) Event come to pass. And the sky will be rent asunder, for it will that Day be flimsy. Then he that will be given his Record in his right hand will say: “Ah here! Read ye my Record! And he that will be given his Record in his left hand, will say: ‘Ah! Would that my Record had not been given to me! And that I had never realised how my account (stood)! Ah! Would that (Death) had made an end of me! Of no profit to me has been my wealth! And burn ye him in the Blazing Fire. This was he that would not believe in Allah Most High. And would not encourage the feeding of the indigent! So no friend hath he here this Day. Which none do eat but those in sin. That this verily is the word of an honoured messenger. “there is no guidance except through the Qur’an…if they would only use their reason. When seeing all the easier routes at her disposal, the Muslima thinks “Ya Hadi, ahdinee…” (“O Guider, guide me…”). If you wanna see more artwork, please see the “Visual Art” page…. Jazak/i Allahu kheira for viewing! Allah yarhamu (may Allah s.w.t. have mercy on his soul). “In whatever business thou mayest be, and whatever portion thou mayest be reciting from the Qur’an,- and whatever deed ye (mankind) may be doing,- We are witnesses thereof when ye are deeply engrossed therein. Nor is hidden from thy Lord (so much as) the weight of an atom on the earth or in heaven. And not the least and not the greatest of these things but are recorded in a clear record. Surat Al-Furqaan. 25:31. Sahib International translation. May Allah reward the brother for writing and sharing this..I really liked this article. I have to admit that my own prayers are severely lacking (effort, emotion…and that ever important quality-Khushu’). if Allah s.w.t. Would judge me on the quality of my prayers….it would probably seem to Him that I just don’t care, enough 😦 but my resolution, which I will now make every year (starting with Ramadan–so i am now working towards next ramadan) is that i will not miss any prayers (unless of course, out of forgetfulness or sleep) ..I.e., no more make up prayers. The time is now, for myself (to do that)…and also: i will have more of a connection with Allah s.w.t. 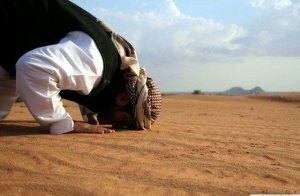 ..I will (also) use the advice by the brother to see prayer as a gift from Allah to me…a loving gift…*not something I have to do, for Him (subhanA-He is far above that.). mA. Jazak / jazakum Allahu kheir.